This portfolio is the start of a growing collection of visitor photographs taken during the sailing day. Be sure to take flippers, goggles and snorkel or use those provided, to explore the rocks and beaches in the clear sea. Be ready to relax on the waves as you sail across to Skopelos. Look forward to a wonderful Greek lunch on the after deck with the friends you make on the day and remember to take photographs to share in this photo guest book afterwards. Send in your photographs to editor@focalview.co.uk subject' Aegeo Images' and we will include them in this guest photo review portfolio at the next update. You may wish to have an exclusive portfolio of your own photographs to share with friends and family. Your page-turning collection can be read on most screens and comes in a range of download options. 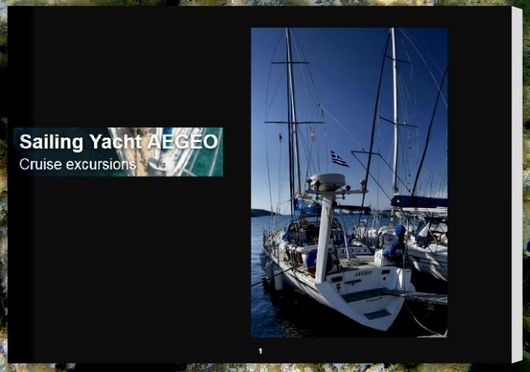 Link here to have us make your Portfolio which will also be hosted free of charge on this page so that other guests can see how you enjoyed your day on Aegeo. These portfolios are photographic memories and impressions of the sea around the islands on a day sail with Aris and Marilia on board their yacht. The views; above and below the water make opportunities for outdoor photography and bring visitors from all over the world.